As we start deploying the various pieces of infrastructure needed to support Roadmap you may see some different things in your Office 365 Tenant – so here is a quick explanation of the different parts and what they mean – and the most asked question – how to turn it on!. One thing that people have noticed is the new service plans that show up under Project Online Professional and Premium. The top 3 are new, and are used behind the scenes for the various parts of Roadmap – Common Data Service for Apps (CDS), Flow for Project – and P3 which you can think of as the Project Online equivalent to E3. These would have appeared around the end of November – but do not mean that Roadmap is deployed – just some of the pieces we needed in place first. Along with the CDS comes a new App link to Dynamics 365 – even if you didn’t previously have any Dynamics subscriptions. Starting today, December 7th 2018, we turned on Roadmap, but just for a small percentage of tenants initially. The tenant administrator can check if it is available yet for your tenant by going to Office 365 Admin Center - https://admin.microsoft.com/AdminPortal/Home#/homepage and then the Settings option and the Service & add-ins option under that. 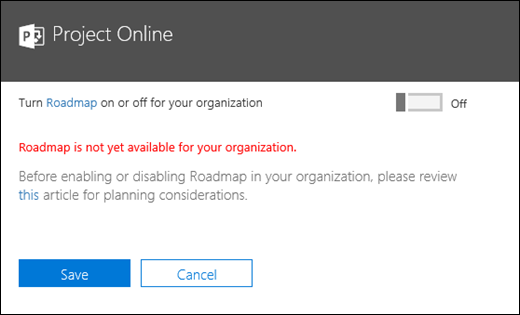 If Project Online isn’t shown it could be that no one has visited https://project.microsoft.com (the new Home experience) recently – as that page is used to trigger the back-fill of other Roadmap requirements – so go to that page – then look again at the admin center. If Roadmap is ready then you will see the same – without the red note – and you can slide the switch and Save to turn Roadmap on – after reading the mentioned article of course!. One you have switched on then you can navigate back to https://project.microsoft.com – or hit the Project icon in the App Launcher – and you will land on the Home page – but it will have a new super power – creating Roadmaps! For further help on Roadmaps you can see our new videos on the Welcome to Roadmap landing page - https://support.office.com/en-us/article/video-welcome-to-roadmap-57764149-51b8-468f-a50d-9ea6a4fd835a. There will be even more videos arriving from December 10th 2018 onwards. If Roadmap isn’t ready it could be that we are still not fully rolled out – or that your tenant needs to be updated to CDS 2.0 and we should have more information on that soon. Good to know about the new features. But when i tried in my tenant, I couldnt see “Project Online” under Services and Add-ins. As explained by you I have then visited https://project.microsoft.com (the new Home experience), still it doesnt appear. I can see the new service plans that show up under Project Online Professional and Premium. Can you please help me how to get the option so that i can turn on the Roadmap for my instance. We are still rolling out the feature PS2013 – so it may just be that we haven’t reached you yet, although if the Project Online option isn’t showing I’d suggest opening a support incident now, rather than wait until we finish the roll out and then find there is some other reason blocking you. Your O365 Admin should be able to open a case – and if it doesn’t get traction suggest the support engineer you are assigned talks to me. Sure thing, Brian!! Thank you very much for your super fast response. Do you have any release date for french users/tenants ? When going to “Project Online” -> “Services & add-ins”, we get a message saying we must upgrade CDS to CDS for Apps. Reading this documentation, I cannot find any way to upgrade CDS for Apps in our tenant. It looks like it concerns only PowerApps. And we don’t have PowerApps Plan 2 licences. So I cannot manage “environments” nor Upgrade Database. I don’t see anything specific to Project Online either. Hi David, I’d suggest opening a support case with the PowerApps team (through the O365 portal – your O365 admin (if you are not an admin) should be able to do this). I’ll also investigate my side so we can get the documentation improved if it does not fit in scenarios such as yours.